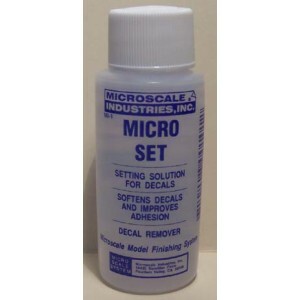 Micro Set is a very versatile decal setting solution that does several things to the decals to improve application. Micro Set is a very versatile decal setting solution that does several things to the decals to improve application. Micro Set should be applied to the surface of the model where you will be sliding off the decal. Micro Set prepares the surface with special wetting agents that cuts the oils in new paint and converts the adhesive on the back of the decal to a stronger and more lasting one. 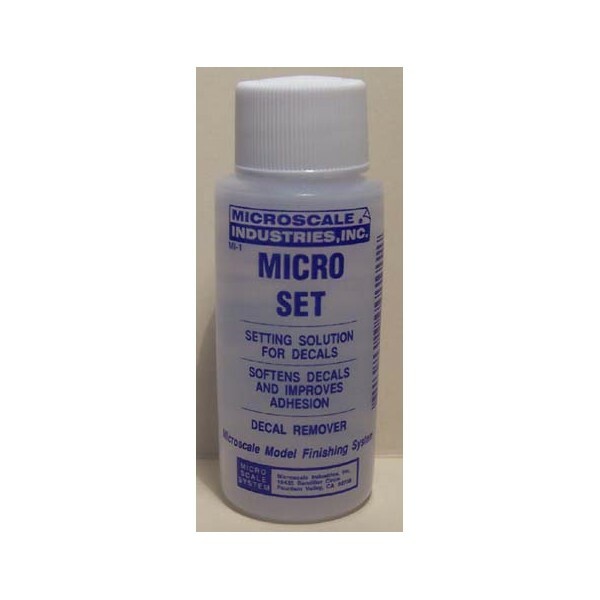 And finally, Micro Set slightlyMicro Set is a very versatile decal setting solution that does several things to the decals to improve application. softens the decals film to make it more flexible so that it can conform better to the model's surface. Better adhesion by the decal to the model prevents tiny air bells from occurring and results in an invisible carrier film or the so called 'painted on look'. To apply Micro Set, use a soft flat artist’s brush and apply Micro Set where you are going to apply the decal. Then slide off the decal. Using a small pointed tip synthetic bristle carefully position the decal. Blot the decal carefully with tissue or paper towelling so as not to move it and allow to dry overnight. It is ready for a protective coat of Micro Coat Flat, Satin or Gloss.